The instructions in this posts have been tested on Windows 7 Ultimate 64 bits and Windows 7 Home Premium 64 bits, using Cygwin 6.1, Eclipse 3.5.2 and obviously, Android NDK r7. The commands to compile Android native code are from this post. 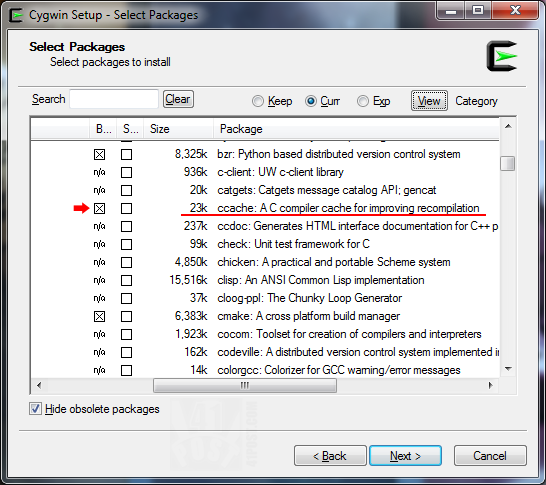 After selecting ccache, proceed with the installation by clicking on the 'Next' button. With ccache installed, it’s time to configure the system to make this tool work with the NDK. Just as explained in the Android NDK’s official documentation, create an environment variable named NDK_CCACHE that points to the ccache binary. 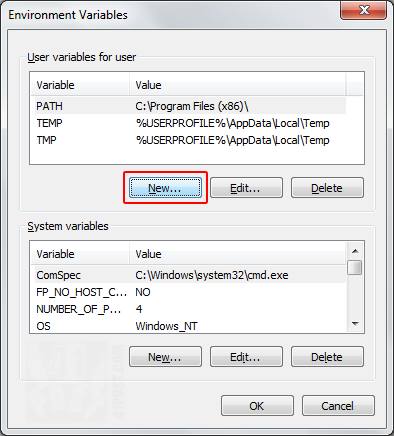 To accomplish that in Windows 7, just open ‘My Computer‘, right click anywhere and select Properties. At this recently opened dialog select Advanced system settings. This will open another dialog with some tabs; select the one labeled Advanced and click on the Environment Variables button. Select the 'Advanced' tab. 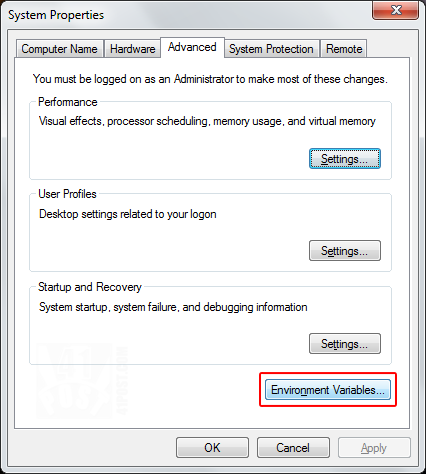 Click on the 'Environment Variables...' button. Click on the 'New' button as shown above to create an user variable. The recently created user variables should be something like the ones pictured above. Click on 'OK' to confirm the changes. Assigning administrator privileges to 'bash.exe'. Repeat this process to 'ccache.exe' and 'eclipse.exe' . Some statistics displayed by ccache after correctly configuring it to work with the Android NDK. Congratulations, ccache is running as it supposed to. At this point, it’s possible to try to remove the administration rights from eclipse.exe, bash.exe and ccache.exe and test if ccache works without it. One last tip: as hinted by CyanogenMod’s Wiki that explains how to speed up builds, try to use a some of the RAM as a disk to speed up compilations. There are some great third-party software out there to create RAM disks, such as the Dataram RAMDisk , ImDisk and Gavotte Ramdisk. Just set the ccache folder with the CCACHE_DIR variable to the ram disk to benefit from it’s performance. If there were some errors during the compilation process, such as messages telling that the cache directory couldn’t be found, and you are sure that the path at the CCACHE_DIR variable is correct, try passing it as a POSIX-style path, instead of using a Win32 path. Also, check if eclipse.exe, ccache.exe and bash.exe have administrator rights. 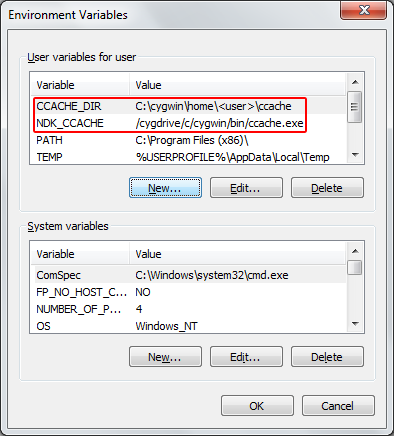 As default, ccache tries to create a .ccache folder inside Cygwin’s user folder. Windows doesn’t like folders that starts with a dot, so as the NDK. This could be simply fixed by setting ccache to use another folder. Also, remember that changes made to environment variable will only take effect after closing and re-launching a software. So, case you want to check if ccache is reading the CCACHE_DIR variable correctly, you must close Cygwin’s bash and repeat the ccache -s command. This is also valid for Eclipse. 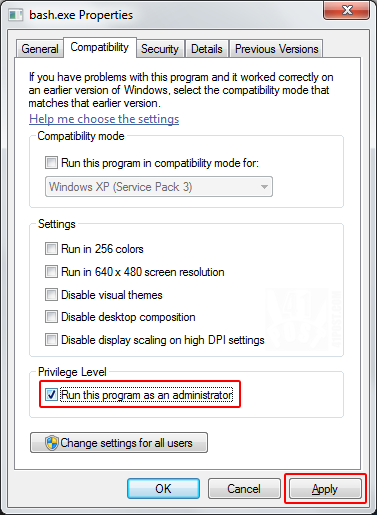 After trying this configuration on two different Windows installations it was possible to remove the administration rights from the three mentioned executables, however this made ccache stop working on one of the machines. Also, one accepted the CCACHE_DIR value as an absolute POSIX-style path, while the other one required it formatted as a Win32 path. For large projects, you might also want to increase the cache size. To do so, look at ccache’s help by typing ccache -h on how to do so. What are your experiences with the newest NDK revision? Got ccache working and have some useful tips? Please share it in the comments below. Absolute load of rubbish – you CANNOT use a cygwin version of ccache with the NDK, FAIL.